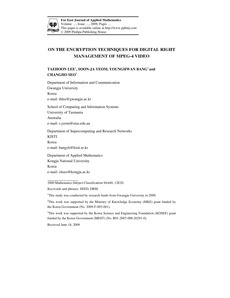 This paper presents encryption techniques for digital right management solutions of MPEG-4 streams. MPEG-4 is a format for multimedia streaming and stored in the MPEG-4 file format. We designed three kinds of encryption methods, which encrypt macro blocks (MBs) or motion vectors (MVs) of I-, P-VOPs (Video Object Planes), extracted from the MPEG-4 file format. We used SEED to encrypt MPEG-4 data. Based on these three methods, we designed and implemented a DRM solution for an Internet broadcasting service, which enabled a MPEG-4 data streaming, and then compared the results to get an optimal encryption method.